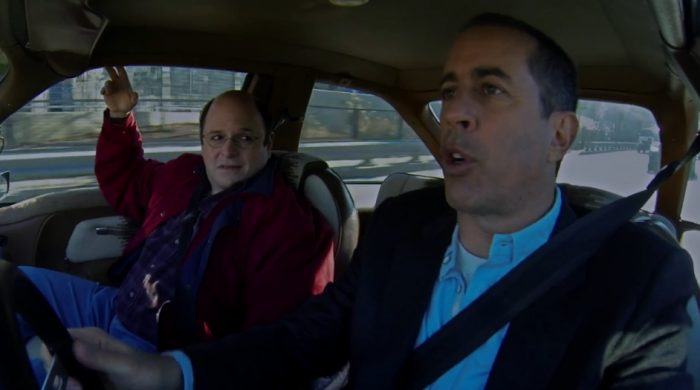 Generally, episodes of Jerry Seinfeld’s Comedians in Cars Getting Coffee are reserved for letting the funnyman take his comedy contemporaries out for a spin in one of his lavish cars. We’d been hearing rumblings for some time of a Seinfeld reunion having been filmed at the same Tom’s Restaurant in New York that featured prominently on the show, but we had no idea in what capacity the reunion would take place. Then last night’s Super Bowl happened (yeah, that’s right, you totally forgot, Denver Broncos). 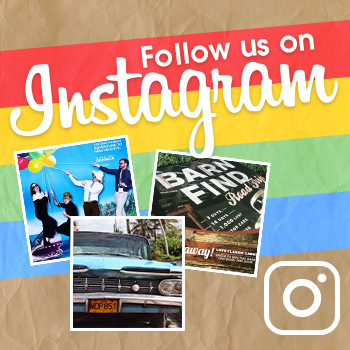 A brief teaser ad at halftime confirmed that Jerry and George had indeed reunited for the latest episode of the web series, which is now live at ComediansinCarsGettingCoffee.com. And it’s a doozy, featuring the beautiful 1976 AMC Pacer. And what a wonderful car it was! The episode, entitled “The Over-Cheer” in a nod to Seinfeld episode titles of old, begins with the standard shots lovingly poring over every inch of the episode’s vehicle and the sound of a ferocious engine being brought to life. 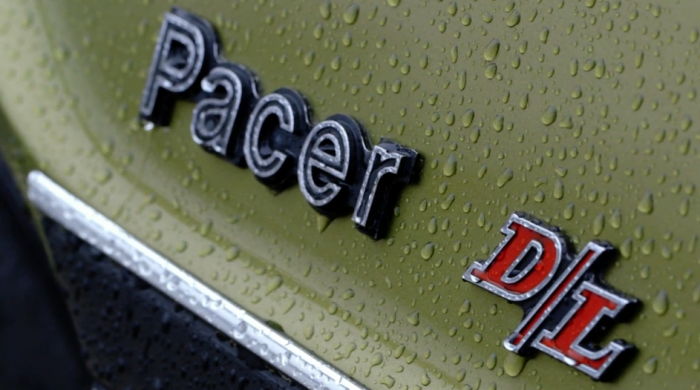 In this case, the Pacer, which Seinfeld reminds us was “a total disaster from initial concept to final execution,” fittingly struggles to start. 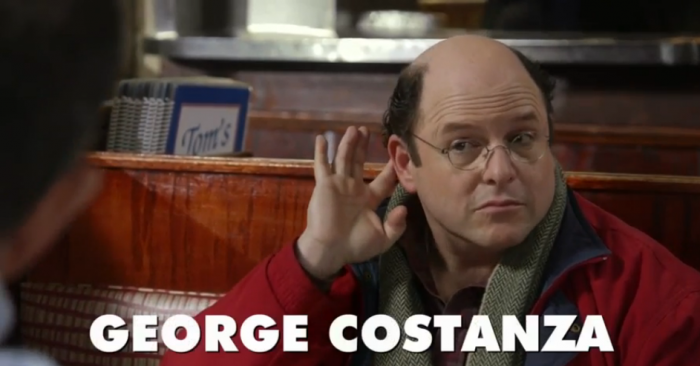 George Costanza: still charming after all of these years. “George was my best friend for almost every single day of the 1990s.” Ah, don’t we remember it well. 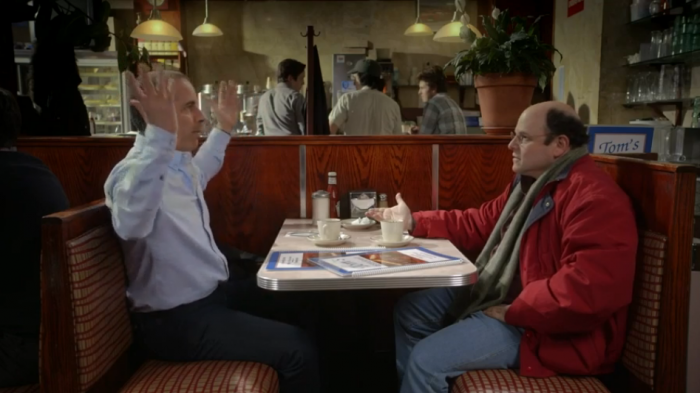 The segment begins with George (Jason Alexander) and Jerry just as we love them: bickering about minutiae. The stage has been set to suggest that the duo have left the Super Bowl at halftime to get coffee; given the fact that the game between Denver and Seattle was essentially over from the first play from scrimmage, this could not be more prescient. Jerry wants to take George to a new place where they punch up the taste of tuna with cinnamon (and because they put the cinnamon on the tuna for you), only to have to settle for trusty Tom’s upon finding the new place closed up. They take their seat, and any one of us who spend a profound amount of time in the 1990s laughing at a show about nothing is likely to feel something approaching chills as George and Jerry pick up seemingly right where they left off about 16 years ago. As the story goes, Jerry reveals through a mumble that he had in fact been invited to the Wassersteins’ Super Bowl party. George, on the other hand, was not welcomed due to his antics a few Super Bowl parties prior. “Because at their Super Bowl party two years ago, the Giants were in it and you over-cheered, you ruined the whole party,” Seinfeld tells George. And, just like that, thousands of nerds gasp in delight as the Seinfeld’s postman nemesis (played by Wayne Knight) returns. 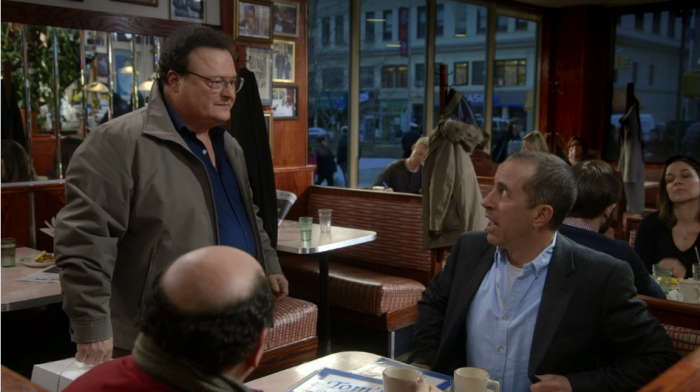 Having gone on a run for Danishes to accommodate the “savory” Wasserstein party, Newman’s presence at the party means that Jerry won’t be going anywhere. “The Over-Cheer” ends, rather appropriately, with the Pacer failing to start outside of Tom’s (and Florida plates suggesting that the car might belong to Jerry’s parents in the Seinfeld universe) as the snow begins to fall. While we didn’t get to see Elaine (Julia Louis-Dreyfus) or Kramer (Michael Richards), Seinfeld co-creator/writer Larry David was present off-camera to make the Seinfeld reunion all the more official. Seinfeld, Alexander, Knight, Louis-Dreyfus, and Richards all previously appeared in a series of episodes during the seventh season of HBO’s Curb Your Enthusiasm, which also starred and was created/written by David (and is absolutely worth binge watching if you’ve never seen it). This taste of an old favorite is bittersweet for its brevity, but it hits the spot nonetheless. Be sure to check out “The Over-Cheer,” along with other episodes available at ComediansinCarsGettingCoffee.com. Perhaps enough views might just inspire that 10th season that we’ve all been pining for all of these years.